Ph’nglui mglw’nafh Cthulhu R’lyeh wgah’nagl fhtagn. Ph’nglui mglw’nafh Cthulhu R’lyeh wgah’nagl fhtagn. Ph’nglui mglw’nafh Cthulhu R’lyeh wgah’nagl fhtagn. Ph’nglui mglw’nafh Cthulhu R’lyeh wgah’nagl fhtagn. Ph’nglui mglw’nafh Cthulhu R’lyeh wgah’nagl fhtagn. You may have heard a raving lunatic singing the chant (or the Christmas carols). You might have heard rumors of the thing, or seen a plushie. You may even be wondering, just what is this Cthulhu thing? And how do I even pronounce that? First, there’s no wrong way to pronounce Cthulhu, as our mouths are entirely the wrong shape (and have nowhere NEAR enough tongues) to pronounce it properly, but I prefer Cuht-foo-loo. Take a seat, brother. Grab your elder sigil and clutch your sanity dear, for I will tell you. Of Cthulhu, who lies dead but dreaming, and lost R’lyeh deep under the waves. Who’s this Cthulhu guy anyway? Cthulhu is a being known as a Great Old One, a race of beings that once ruled this universe, until the Elder Gods locked them away. First revealed to mortals in the story The Call of Cthulhu by H.P. Lovecraft, Cthulhu is described as a gigantic being, 1/2 squid, 1/2 dragon and 1/2 human (he’s an old one, your puny mortal mathematics cannot contain him!) currently dead, but dreaming, in the sunken city of R’lyeh off the coasts of New Zealand and California (it’s that big). Cthulhu is waiting for the stars to align just right so that he may awaken/reincarnate and take back to world that we humans currently infest, bringing with him an eternity of darkness, the return of the old ones and the destruction of mankind. This is, of course, TOTALLY F**KING AWESOME AND METAL. Which is why there is an entire debased cult of people dedicated to waking him up as soon as possible. “But why would anyone want to wake up something so horrible and evil?” I hear you ask. Well, that’s easy. He’s going to wake up anyway. There’s nothing anyone can do to stop that (maybe delay the inevitable, but not stop). Those of us who believe (at least, those of us not fish-persony enough to serve him for eternity) however, will get to choose whether we are eaten first or last! Want to be spared the soul-shattering horrors to come? Get eaten first! Want to sit back and enjoy the end of everything humanity has ever wrought? Get eaten last! Plus there are the typical benefits of being a part of a depraved cult of lunatics, like not being stared at when you talk or laugh maniacally to yourself (having an evil cackle is actually a prerequisite for joining). 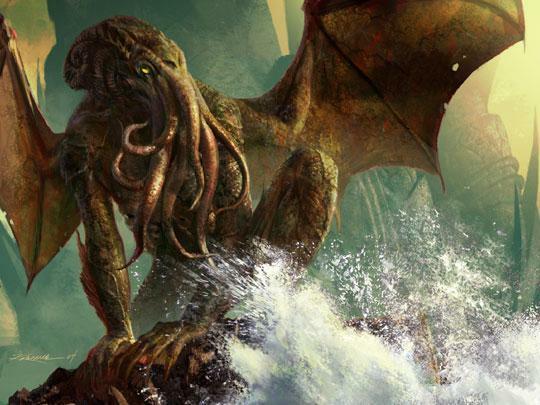 Now, some people have drawn parallels to Cthulhu fans and certain other subcultures. I’ve even heard the phrase “the geek version of goths.” Such a gross oversimplification shall not stand! 1. Goths are nihilistic, while Cthulhu fans are…. no, wait. 2. Cthulhu fans believe that dark forces will someday end the earth, and the best course of action is to ally yourselves with these dark powers. Goths believe…. hmm. Don’t worry folks, I got this. 3. Goth culture has been subverted and cute-ified by the corporate machine, while Cthulhu… oh.